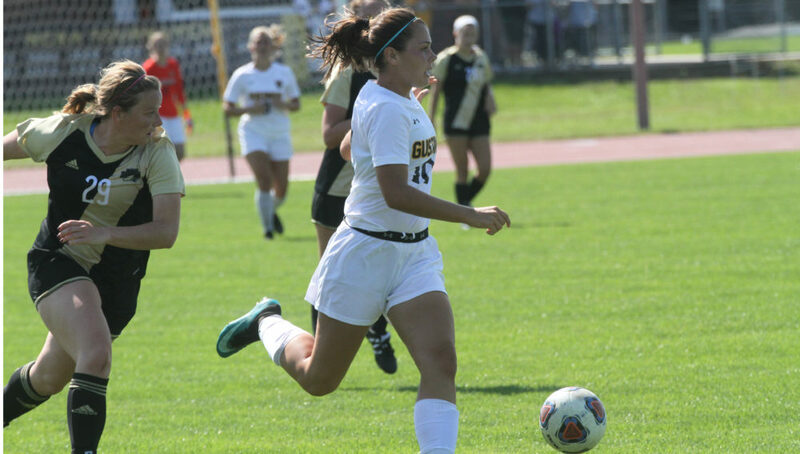 ST. PAUL, Minn. – The Gustie women’s soccer team got back into the win column tonight with a 2-1 victory over Northwestern. With the victory, the Gusties improve to 3-2 on the season while the Eagles fall to 1-3-2. The Gusties came out strong in the first half taking the lead early on a Katie Ashpole (So., Chaska, Minn.) goal in the 17th minute that was assisted by Abby Mullenbach (Jr., Lakeville, Minn.). The goal was Ashpole’s first on the season. The game remained 1-0 until nearly halftime when Rachel Rehnelt (Fy., Albert Lea, Minn.) scored what proved to be the game-winning goal off a throw-in that bounced over a UNW defender and Rehnelt chipped past the Eagles goalkeeper for 2-0 lead. The second half was a different story though as the Eagles outshot the Gusties by a tally of 7-4, but Leah Pavlish (Fy., Prior Lake, Minn.), starting her second match in net on the season, allowed just one goal on the night to secure the victory. Pavlish racked up six saves in the contest and recorded her first collegiate victory in the process. The Gusties will now begin their conference season as they travel to Moorhead, Minn. on Saturday for a 1 p.m. contest with Concordia.